I was asked by one of my fellow bloggers to do a post on the ‘Full English Breakfast’. The reason for this idea was because she’d written a post about the American ‘Corn Dog’ and I had no idea what it was, and vice versa. But I’m becoming more aware now, of the foodstuffs in the land over the pond. Well, the ‘Full English Breakfast’ or ‘Fry-up’, as many of us call it, is one of the most well-known meals associated with Britain. There are many variations up and down the country, but the English version, which I know more about, is eaten quite regularly here. 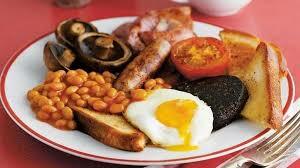 Many restaurants and pubs sell this and call it the ‘All day breakfast’ because it’s that popular. To be honest, the majority of people I know would probably have a full English once a week, usually at the weekend as a treat, on holiday or staying in a hotel, where it is always featured. It’s not healthy at all, and if you ate them every day you would end up in A & E with clogged arteries in next to no time I imagine. I have found to get the true authentic one, it’s a good idea to visit a ‘greasy spoon’. (A cheaply priced café, where they serve basic food stuffs). These places have no qualms about serving you a massive breakfast, and will fry the items with slabs of lard and then soak your fried bread in it. Truly exquisite, I must say. In the town where I live, there was, up to 6 months ago, one of these cafes. It was called ‘Crustys’ and you could purchase a small breakfast with toast and a cup of tea for about £3.50, which is a bargain. It was truly lovely, and it was very popular with the local market traders. Sadly it is now closed, and I have no idea why. Bacon…A good quality one. Usually back bacon is used. Cooked until soft and rarely over done. Streaky bacon is pointless , unless you go abroad. 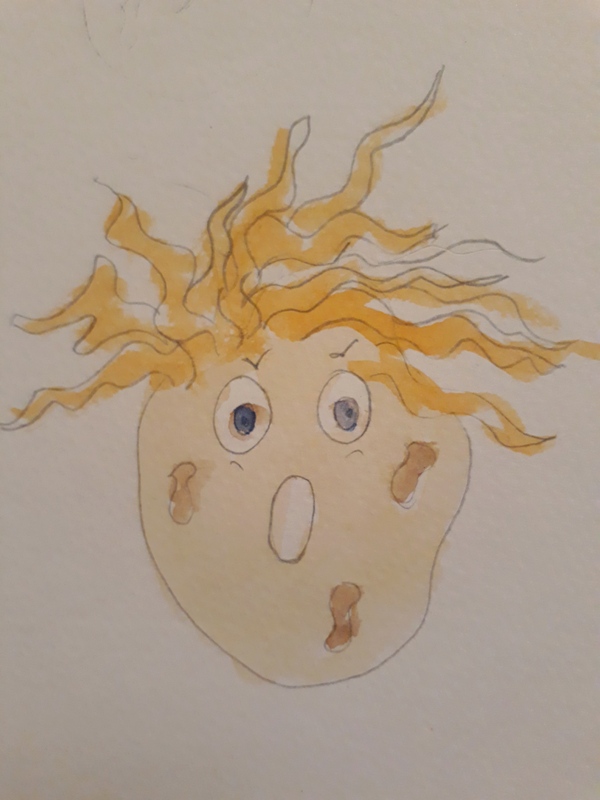 Eggs… Fried or scrambled, and sometimes poached. A good fried egg has a runny yolk to dip your toast in. Sausage… If the establishment gives you two sausages then it’s a winner. A good quality ‘banger’ is important. A chipolata or similar is not allowed. Beans… Baked beans, and a good brand is Heinz or Crosse & Blackwell. Watery beans are a no-no. Tomatoes… Fried or tinned. I like both and depending on where you are determines what you’ll get. Toast or Fried bread… Usually you’ll be given a slice of bread buttered and toasted or you’ll have a piece of fried bread, which is very nice indeed. Black pudding… Now this apparently is quite common , yet everywhere I’ve ever been for a full English it’s not featured or you have to ask for it. Which is fine because it’s made with pig’s blood, fat, oatmeal and herbs . Yes dried pigs blood. Many people love this and I just cannot bring myself to eat it. So this is the ‘Full English’ as I know it. I was reading up about the history of it the other day and it was in the Victorian age where this breakfast was served for the first time.It was mentioned in ‘Mrs Beeton’s Book of Household Management’, a Victorian guide on the best way to live and treat servants in the 1860’s. It’s an eye-opening read!! It was served by the upper classes to show their guests how affluent they were, and to show off their wealth, so nothings changed there really. And black pudding, was first mentioned as a food stuff in 1450, and that’s old. Be the envy of your girlfriends with this sophisticated clutch bag. This meal once in a while is really nice to eat and looks and smells so lovely on a plate, however there are some ways in which the fry up is advertised that just makes me cringe. 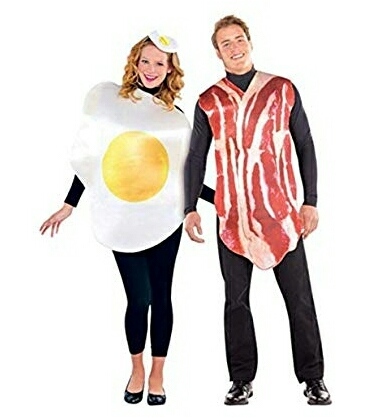 The worst fancy dress costume you could wear. Your other mate could go with you as a block of lard. Grim! 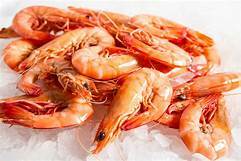 These are popular at the seaside. All of this is made of sugar. I never fancied one, even as a child. 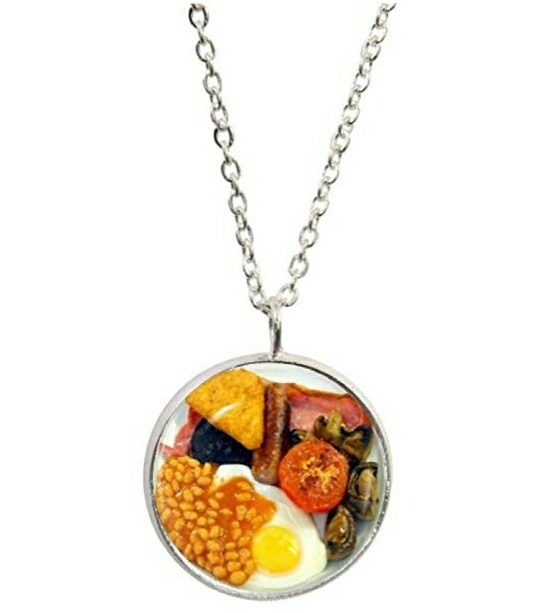 The fry up necklace. Something to give your loved one on Xmas morning. 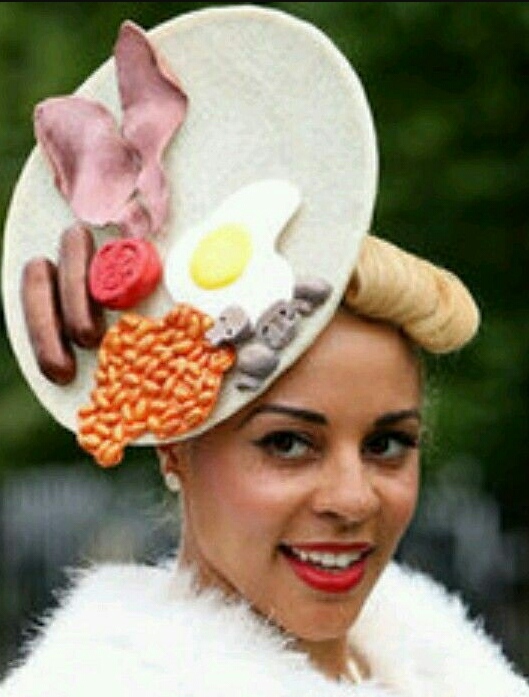 The ‘Fry Up’ hat. Can you imagine wearing this at a wedding. You’d be mad as a box of frogs. PS…I have read that our American friends find eating beans for breakfast odd. Is this correct? Actually, your full English breakfast sounds a lot like a good Southern breakfast here, except for the blood pudding. Bacon, sausage, eggs. We would probably have biscuits (an American version of a scone) and gravy (white gravy) instead of toast. Or we would have grits, made from hominy boiled in milk. I hope to visit England someday and have a proper English breakfast! Kat that is very interesting. What is white gravy and what are grits? Grits are hominy (corn) boiled in milk usually. White gravy is just gravy made with white flour and milk, and sometimes sausage. Allen reminded me of the hashbrowns too. Hashbrowns or fried potatoes also make up part of a southern breakfast! So are grits like Creamed corn that you can get there Kat? YESSS!!! 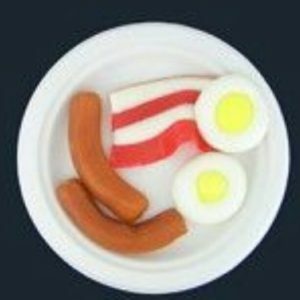 The full English! I’m so excited that you’ve written about it! I agree with Kat about the southern breakfast thing, except I have never eaten beans and eggs together! Ever! Never, never, never. So when I fix a hearty breakfast at our house, I make scrambled eggs with cheddar, crispy bacon, biscuits and sausage gravy! We usually have apple butter and strawberry preserves on the table as well. There are few things I can feel proud about when it comes to cooking, but I do make damned good sausage gravy! Like your full English, this is not a low calorie meal and that’s why we don’t eat it often! I’m not a fan of grits, either, but then again, I just may not have had good grits. And no carrots! Ha! The beans would be bad enough. BTW, breakfast is one of my favorite things to eat for dinner! Anyway, if I ever get to visit England, I suppose I could be persuaded to try beans with my breakfast. Why the hell not! When in England… If you want me to try blood sausage, though, then you’ll have to get me drunk first. And then it will still be iffy. Now what exactly is clotted cream and how is that different from other cream? Is sausage gravy, gravy with sausages in it, or very different? Do you have baked beans in the US in tomato sauce like the brits or are they different? And what would you eat the beans with? Clotted cream is a thick cream made from cows milk and steamed and left to cool slowly. The ‘Clots’ (Vom!!!!) sounds disgusting, rises to the surface, hence called clotted cream. I read up on that. When you have a ‘Cream Tea’ in England you usually get cups of tea with milk, and scones with jam and clotted cream, which originated in ‘Cornwall’, in Southern England. I can’t stand the stuff because I don’t like cream. And now I know that it’s called clotted because it forms from clots of milk it’s really made me feel like I want to wretch. Anyway, lots of people in the UK love a cream tea. That’s really interesting. How long have these donut places been around for in America? 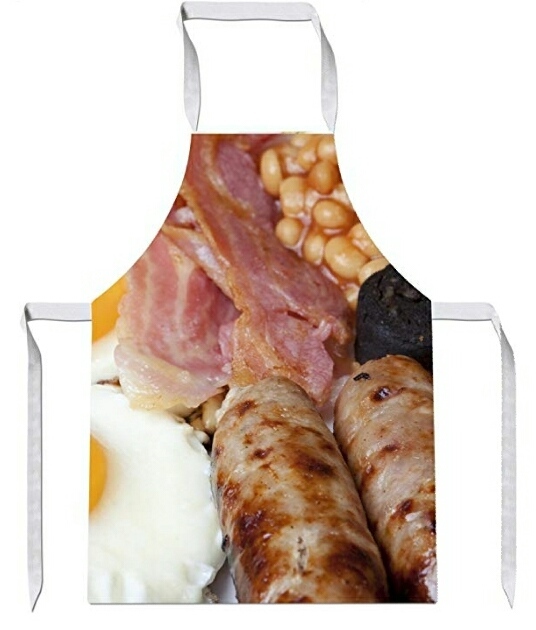 I love it when I get fried bread, black pudding, and fried eggs with runny yolks with my full English breakfast. Black pudding and fried bread are not commonly served in Australia. 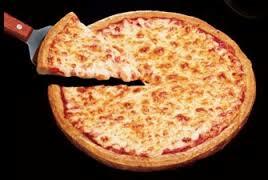 Aaaaaand now I’m hungry. Although I’m not actually a fan of beans, mushrooms, or anything where a primary ingredient is pig’s blood. Or cooked tomatoes, come to think of it. Still the picture looks delicious! Thank you Adie. I can eat a tin of beans cold. My favorite American breakfast item is hash browns. In the southern states, we have a restaurant called Waffle House–and I love getting their hash browns smothered and covered (with peppers, onions, and melted cheese). Yum!